As we approach tax time, we need to turn our focus on one of the most important financial documents we have – our tax return. Divorce can be difficult enough, and with it comes many potential tax issues. Add that to a complicated tax code, and the fact that certain divorce papers do not follow the Internal Revenue Code, and it’s time to break out the Tylenol. But let’s arm ourselves with some knowledge, to avoid mistakes and letters from the IRS (tax problems are expensive!). So let’s start with the basics. Your filing status might appear to be the simplest thing, but believe it or not, many filers choose the wrong one. Since so many items on the tax return depend on the filing status, it is important to get this right. Your filing status is based on a date of December 31st of the tax year. If you were married all year and your divorce was finalized on New Year’s Eve, you file as a Single person (or Head of Household, if you qualify). If you got married on New Year’s Eve, you file as Married Filing Jointly or Married Filing Separately for the year. There is no apportioning, nor can divorced folks file jointly “one last time”. The IRS defines the filing status of “Single” as unmarried. But you are also considered Single if you are married and not divorced BUT you have a legal separation (according to state law) under a decree of divorce or separate maintenance. You are also Single if your spouse died before January 1st of the tax year and you didn’t remarry (although there may be another filing status for you – Qualifying Widow(er), if there is a dependent child). Bottom line – if you meet the definition of unmarried, you file as Single unless you meet the requirements for one of the other filing statuses such as Head of Household or Qualifying Widow(er) with Dependent Child. Everyone wants to be Head of Household – don’t you pay the bills?!?!? That is not exactly what this filing status means. It’s for unmarried taxpayers or married taxpayers considered unmarried, who provide a home for a qualifying child or relative. The IRS website (www.irs.gov) provides a wealth of information and all of the tests to see if the person you plan on claiming is a qualifying child or relative (based on income, residency, relationship, etc.). One good takeaway is that if you support a parent and you actually pass the support test, the parent does not have to live with you. Other relatives do. Again, check the information in the free publications the IRS offers online. If you are married but your spouse did not live with you after June (must be living apart for at least the last 6 months), and you paid over half the cost of keeping up the home during the year for you and a qualifying person, you can use the Head of Household status. Using the HOH filing status, you have the benefit of a higher standard deduction, and an extra personal exemption for each dependent you can claim. And you don’t lose the deductions and credits if you were filing with the Married Filing Separately status. If you don’t qualify for Head of Household status, and you are waiting for your divorce to be finalized, you will be filing with the status of Married Filing Separately. Married Filing Separately is considered to be the least beneficial status. There are certain deductions you are barred from (Earned Income Credit, Child and Dependent Care Credit, Adoption Expense Credit, Education credits, Student Loan interest deduction, etc.). However, there are some good reasons to file separately (for example, your spouse may be difficult and not provide his tax documents; you may have knowledge that your spouse doesn’t claim all of his or her income, employs illegal aliens, etc. ; or you want nothing to do with your spouse as refunds can be an issue). You need to weigh what you lose vs. what you really can lose. Sometimes that limited liability that you get by filing separately lets you sleep at night. In certain cases, all you want to carry is yourself. 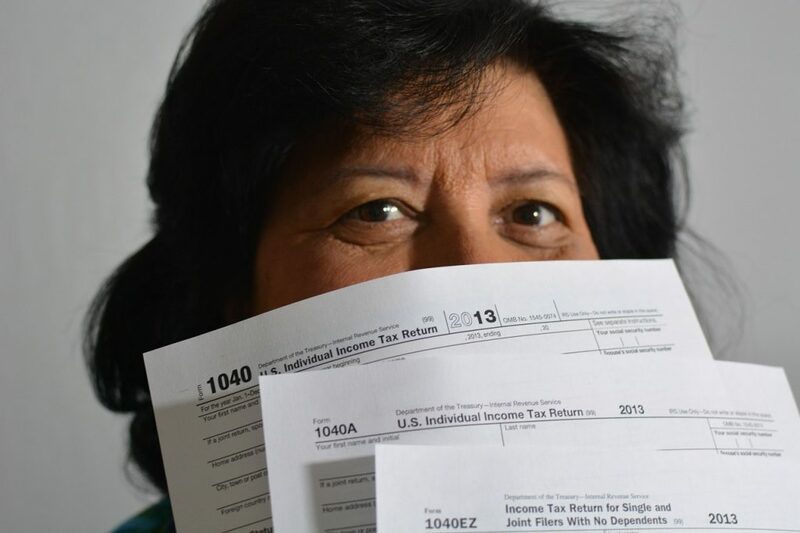 Other good reasons may be less scary – if one spouse has a significantly lower adjusted gross income (AGI), perhaps he or she could better utilize certain deductions limited by AGI, such as medical expenses. With divorce comes issues regarding who can and will be claiming children, and this can affect filing status. And as mentioned earlier, the divorce decree may not follow the Internal Revenue Code, so it’s imperative that taxes are considered when putting it together. Many attorneys do not understand taxes, and that includes certain divorce attorneys. Since this paperwork can affect you for years, make sure a tax professional is consulted. Once you get your filing status right on your tax return, it makes it easier to deal with everything that comes after that. Even if you use a paid preparer, it’s important to understand these concepts. Please visit my website RealLifeTaxAdvice.com for a free copy of the Ultimate Tax Checklist. And if you’d like me to discuss more divorce-related tax issues in another issue, submit your topics at the website. There is no shortage of topics when it comes to Divorce and the IRS. Abby Eisenkraft is the CEO of Choice Tax Solutions Inc. She is a federally licensed Enrolled Agent (EA), an Accredited Tax Advisor (ATA), Accredited Tax Preparer (ATP) and a Chartered Retirement Planning Counselor (CRPC). Abby started her career in tax as a preparer, and quickly gained a reputation for successfully dealing with difficult tax problems, including those previously unsolvable by other tax professionals. She currently specializes in tax controversy cases such as federal and state tax audits, non-filer cases, residency audits, international matters, etc. Abby is passionate about defending taxpayer’s rights before the IRS and State Taxing Authorities. She is a speaker on various tax and financial topics, a consultant (specializing in the self-employed), and is often quoted in the press as a tax and financial expert. She is the author of the new book "101 Ways to Stay Off the IRS Radar", available at Amazon and select bookstores.